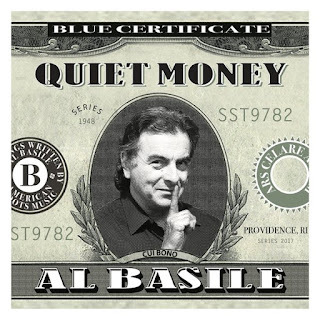 I just had the opportunity to review the most recent release, Quiet Money, from Al Basile and it has great body! Basile, hot cornet player and legendary first trumpet with Roomful of Blues is back with Duke Robillard on guitar, Mark Teixeira on drums, Brad Hallen on bass, Bruce Bears on piano, Doc Chanonhouse on trumpet, Rich Lataille on tenor sax and Doug James on tenor and bari saxes. Opening with Blues Got Blues, Basile and Robillard lead the way with balanced lead lines making for a solid opener. On Simple Ain't Easy, Robillard lays out some really tasty lead work under Basile's vocals giving it great feel. Basile steps up with muted cornet and plays off the tempo for super accent. On title track, Quiet Money, James has the bari out and the heft really sets the track. With an easy swing, Basile's vocals ride the groove on this laid back number. Put Some Salt On It, a prime 12 bar number, Basile lays in a real nice cornet lead, complimenting his vocals and Robillard's guitar work is stinging. Jump track, The Time Is Now, has a snappy pace and loose, flamboyant guitar riffs by Robiolard, and well punctuated cornet lead by Basile. Swing track, I Woulda Been Wrong is one of my favorites on the release with signature guitar riffs by Robillard and some of Basile's best vocals on the release. Robillard really digs deep and lays out some of the most expressive riffs on Not Today. James really steps up with a fat sax solo on True To Form paired nicely with solos by Robillard and Basile. Wrapping the release is ballad, Who's Gonna Close My Eyes? Featuring the vocals of Basile deep bari work by James, Bears piano finesse and a melodic solo by Basile, this is a solid closer to a solid release.